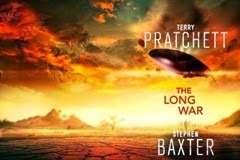 The second book in Terry Pratchett and Stephen Baxter's Long Earth series that takes place over a multitude of parallel universes is The Long War. It's a bit of a deliberate misnomer as an all-out war in the "stepwise" Earths proves to be impossible, but there's a lot of tensions, some to do with the US government's schizophrenic approach to how hands-on it wants to be with the alternate Americas; as well as issues with how to deal with the life forms found in the alternate Earths. I did think after the lengthy setup of The Long Earth that for the next book we'd get something a bit more focused, but this is still a bit of a rambling story taking place over multiple dimensions with various casts of characters, and it never quite got me gripped. I also can't quite buy the central conceit that, within a couple of decades of discovering how to "step," humanity would already be skimming over Earths millions of steps away in each direction, without actually having properly explored the ones nearest to the Datum. The book's enjoyable enough all in all, but doesn't quite get going as much as I expected the sequence to have done two books in.